Spin the Wheel of Fortnite! Week 8 is here, surely you’ve unlocked Ragnorok? IF not, blast through the latest set of challenges and he will be yours in no time at all! Eliminate Opponents – Greasy Grove, Lonely Lodge & Fatal Fields in that order, doesn’t need to be in the same game! Deal Pick Axe Damage – Get in Duo, Squads or 50v50 and whack those downed opponents! Collect Treasure – Navigate to square D9! Shotgun eliminations – Just play the game and this will come naturally! Use a rift – Again should come fairly naturally, just play the game!! Place Traps – Plant 10 traps, just place them as soon as you pick them up, easy. 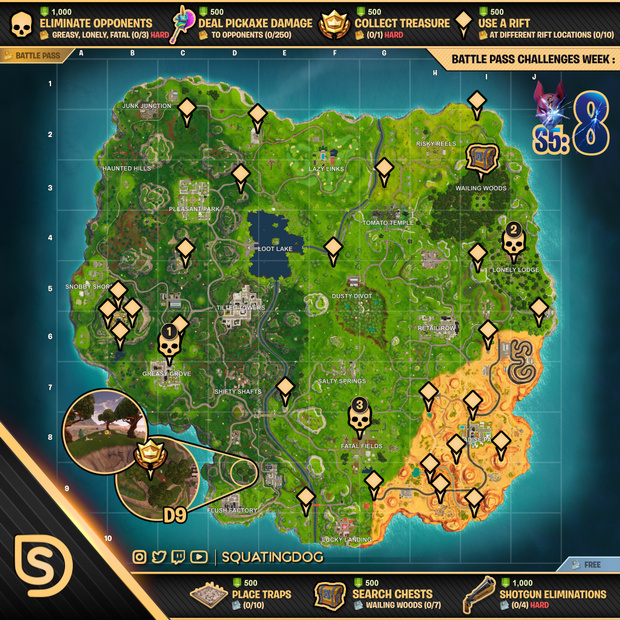 Search Chests (Wailing Woods) – Bit of a pain as not THAT many chests, however after a few days will be empty and should be easy to complete. Happy hunting and building, and as always if you’re not sure which one to do first? Let the Wheel Decide where to land and take it from there! Why not try out our new Fortnite Challenge Cards!